This Website User Guide is to help members of the CFHRI make best use of the online capabilities of the website. What is available in the Members Only area of the website? 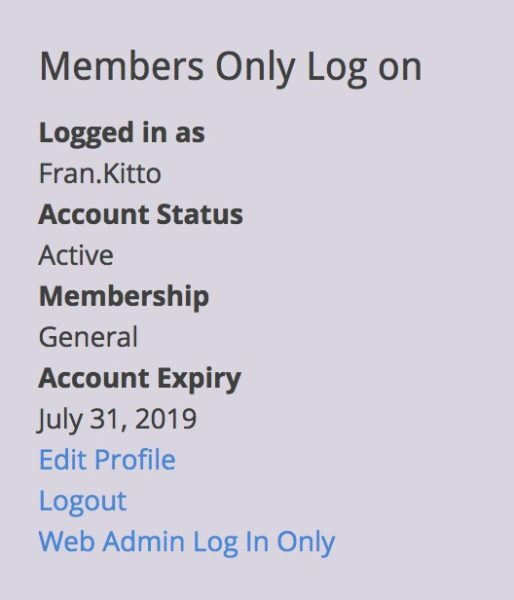 To log onto the members only area of the website you need to be a current member and have a user ID, email address and the password associated with the user ID and email address. If you are a new member and have not received an email with these details then contact us to request your log on details. Once you have these details you can log on via the bottom right hand side of most pages. Figure 1 shows the details prior to logging on and Figure 2 the status once you have logged on. Note: The images on this page are not clickable for actions except to increase images sizes, when available. 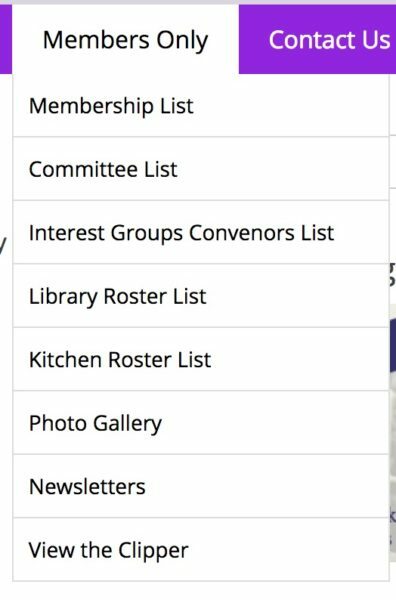 Once logged on you have access to the pages in the Members Only area that can be found via the main menu item Members Only. 2. What is available in the Members Only area of the website? As seen in Figure 3 there are a number of options available to view in the members only area. The main menu link will send you to different pages. If you are not logged on then you go to a page so you can log on with details similar to figure 1 above. Or if you are logged on you go to a page with details similar to figure 2 above. Some items that need to be downloaded and you can find additional instructions on downloading further down this page at the How to Download section. Tips on Using PDFs may also be of interest. Newsletter are the past 3 versions only as material goes out of date and the Caloundra Clipper starts with edition 94 from September 2016 to the most recent edition added. Any material may not be totally up to date depending on if the webmaster has been given the update and then had time to update the pages. Start by clicking the link “Edit Profile” as seen towards the bottom of figure 2. 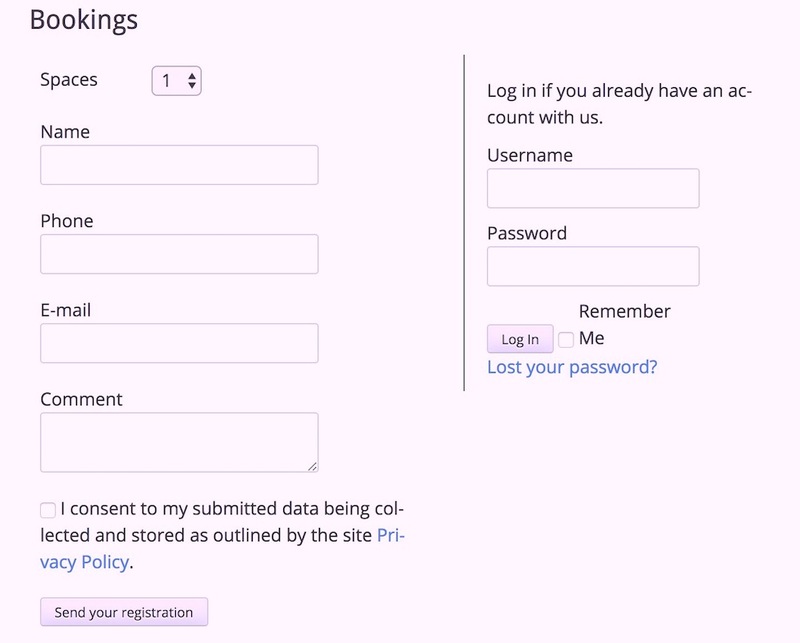 The editing your profile form example, see figure 4. For a larger view of this image, click the image. Your username or membership level cannot be changed. You can change any other fields. You might prefer a different first name, for example. 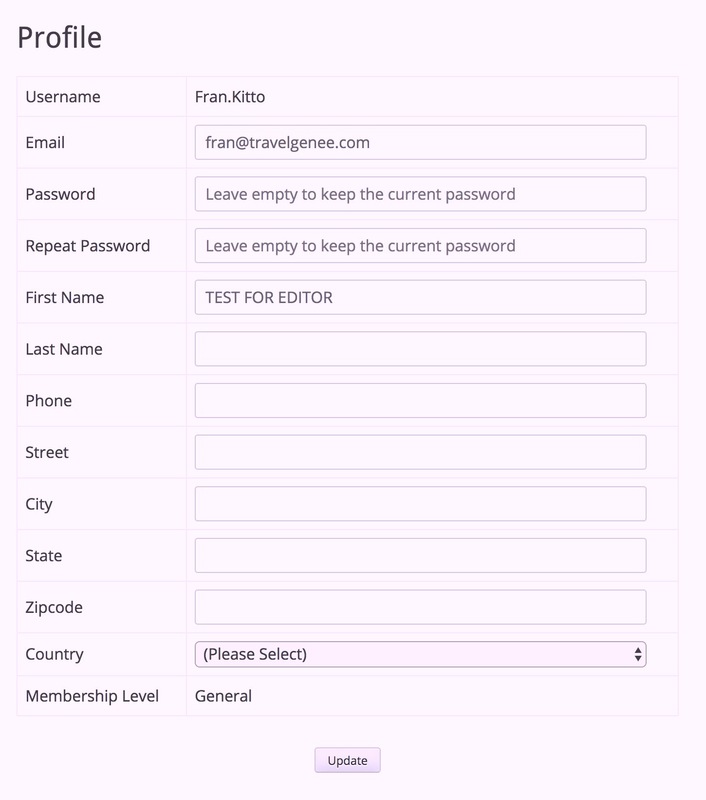 Currently it is not necessary to update empty fields as this data is managed via our membership records. If you wish to change any membership details then contact us. The profile section can also be used to change your password to one you prefer. Remember to note your password or save it in your browser, if you prefer this option. If you forget your password see the instructions – Forgotten your password or Resetting your Password. If you wish to change your email address to log in and receive automated website emails then this is possible. However it will not change your “official” CFHRI emails for membership, newsletter and other emails sent as part of your membership. If you wish to change this email address then please contact us with the changed details. After any changes click the “Update” button towards the bottom of form. Complete your members only / account email address and click “Reset Password”. See Figure 5. If you are using your members only / account email then you will receive an email with your new password. The website generates what is considered to be very secure passwords. See figure 6. You will need access to your emails to retrieve your new password. See figure 7 for an example. It is a good habit to get into not to log in to sites via emails. For this reason there are no links within this particular email. Go to the CFH website and use the details provided in the How to log on and off the members only area section above to log on. See Figure 1. If you cut and paste the User Name and Password from the email then typing errors can be avoided. Once logged on you can change your password to a choice you prefer. 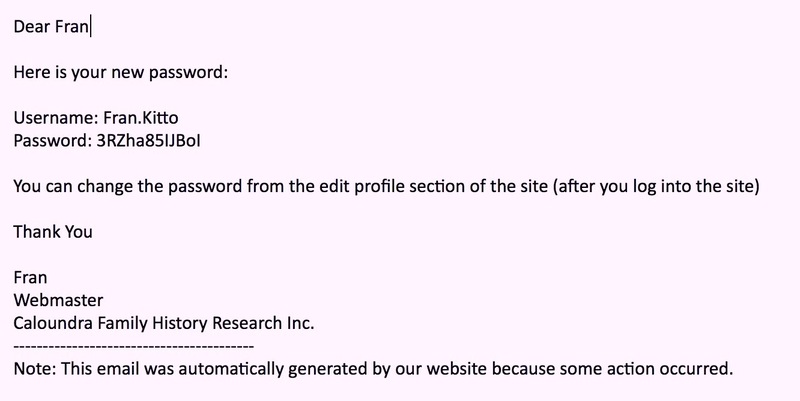 See Figure 4 – Editing your profile instructions. On changing your password you will be logged out and need to log on again using the new password. If you or someone else has changed your password you will get an email to your members only / account email address confirming this has happened. So if you have not changed it yourself please reset it again immediately and contact the webmaster. See figure 8. Note that booking and paying for events are two separate operations so you can do one or the other or both at different times. Ensure you read the details and instructions on the event page. If you have any queries feel free to contact us via the suggested methods on the event page. 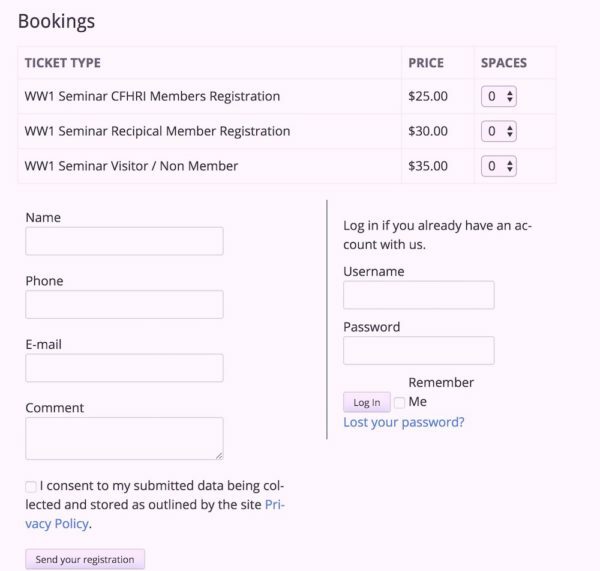 The first section in booking events without payments for members and visitors. Following this is bookings with payments for members and visitors. Note: Some events may have charges listed in the event details but not noted in the bookings area. These still require payment and details are provided in the booking confirmation email and on the Events & Products payment page. 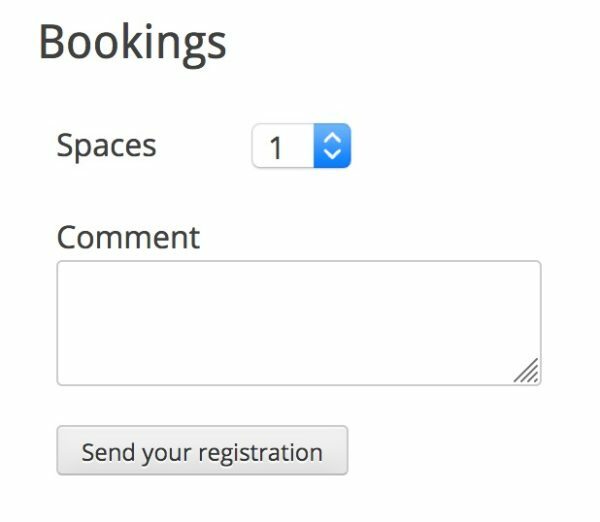 Booking for an event while logged on as a member is the quickest and easiest way to book an event as you do not need to retype in details such as your name and email address. You just select how many spaces you wish to book and leave a comment with any details event instructions requested or any comments you wish to provide to the event convenor such as the names of additional people if you are booking more than one person. See figure 9. Then click the “Send your registration button”. The webpage will then confirm if your booking was successful. You will receive an automated email from the website confirming your booking details. It will vary slightly depending on the event or comments you included. Here is an example in figure 10. 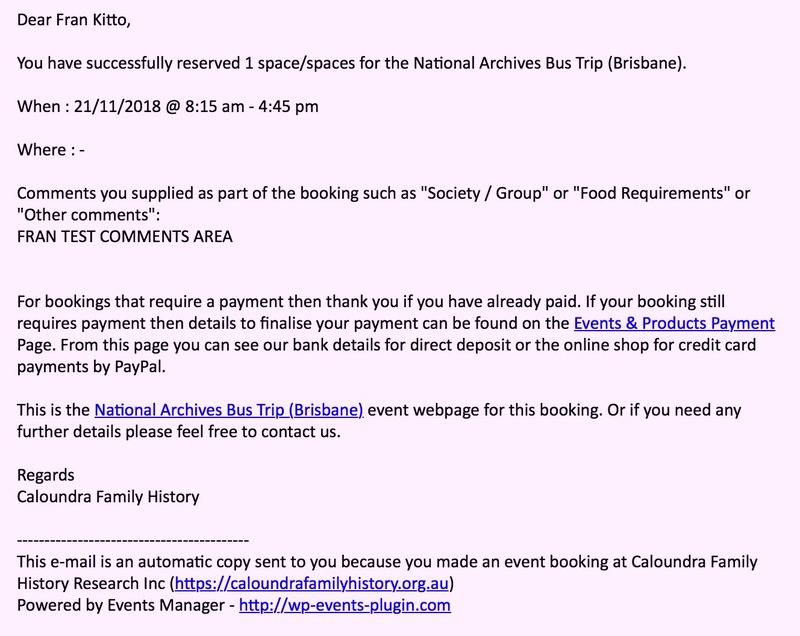 Figure 10 – Event booking email. CLICK image for a larger view. 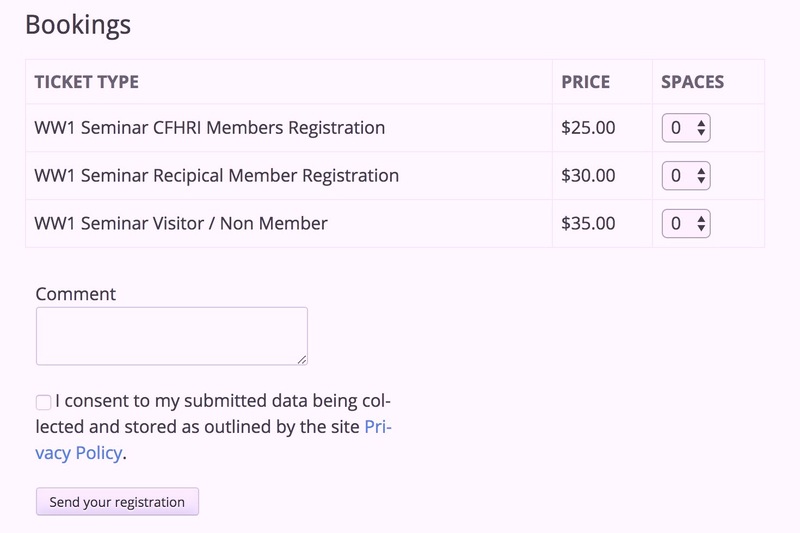 At the same time CFHRI and or the convenor of the event gets an automated email confirming your booking with your name, email address and any comments you added while making the booking. Figure 11 is an example of the form used to book as a visitor or using a different email to your CFH website registered email address. 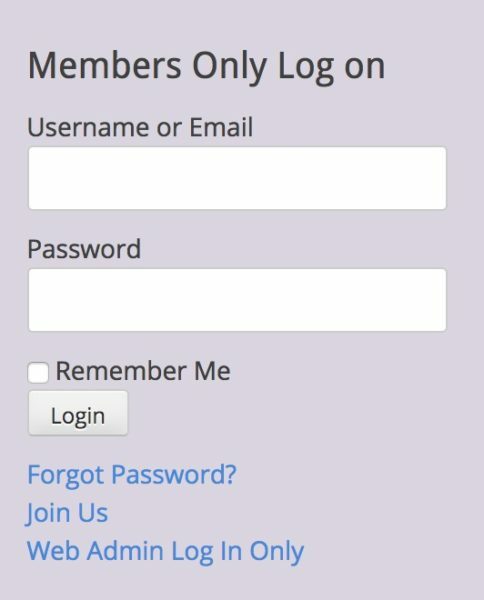 If you have already been provided with access to the members only area you will need to log on using the form to the right on figure 11. Members need to log to have the convenience of being able to see their current bookings. If you try to book using an email address that is already registered on the website then you will get the following message. See figure 12. To proceed you need to log on to create a booking. See the user guide instructions on how to log on above. Forgotten your password or need to reset it. See the user guide instructions above for this also. There is a charge for some events. In these cases it is necessary to select the type of booking and number of bookings you require. Complete the comments section with any details requested on the event page or any comments you wish to add. 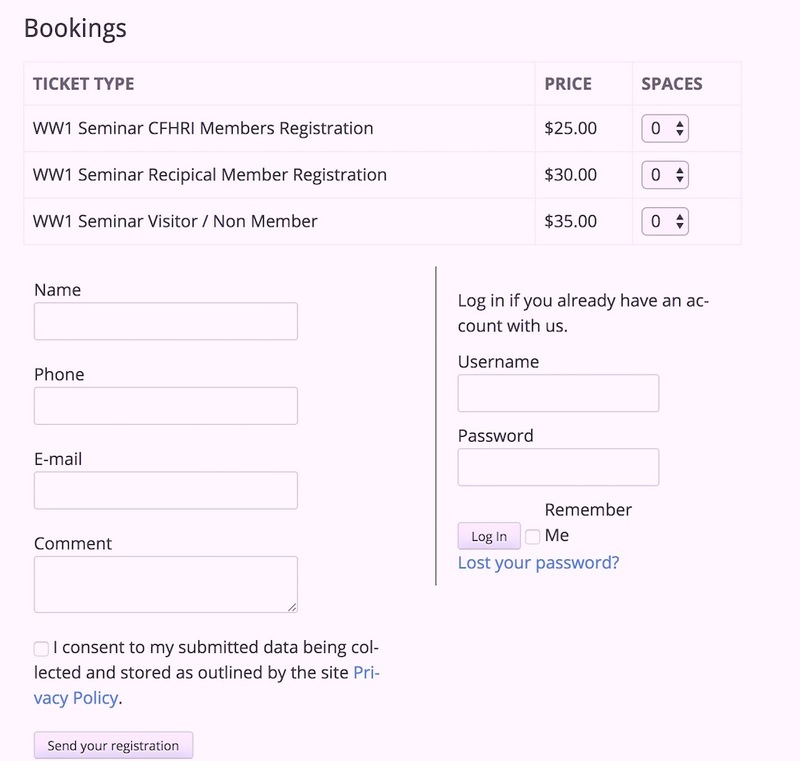 When you book as a signed in member then select the number and type of spaces from those provided and add in the comments area extra names, for example, and any necessary details as requested in the event details such as food requirements. See figure 13. Visitors complete all the details including in the comments area any necessary details as requested in the event details. See figure 14. Events or products can be paid for by Direct Deposit or Credit Card Payment via Paypal or Cash at the rooms. Note: Some events may have charges listed in the event details but not noted in the bookings area. These still require payment and details are provided in the booking confirmation email and on the Events & Products page. 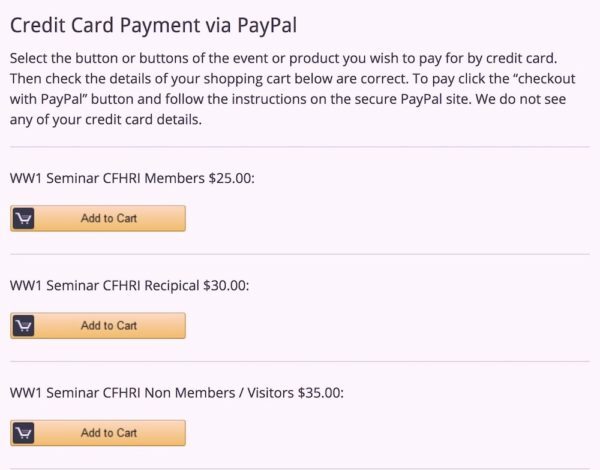 The Events & Products page details how to make payments. Events or products can be paid for by Direct Deposit or Credit Card Payment via Paypal or Cash at the rooms. When bookings have been made online, forms at the library or other method you can still pay by your selected payment method. If you wish to pay by credit card via PayPal then look for the “Add to Cart button” for the item(s) you wish to order. Click the button. The towards the bottom of the page is updated to show the items in your cart. See figure 16. You can add more items by changing the quantity or clicking the “Add to Cart” buttons as shown in figure 15. Once you have finalise your selection then click the “Checkout with PayPal” button. Figure 16. 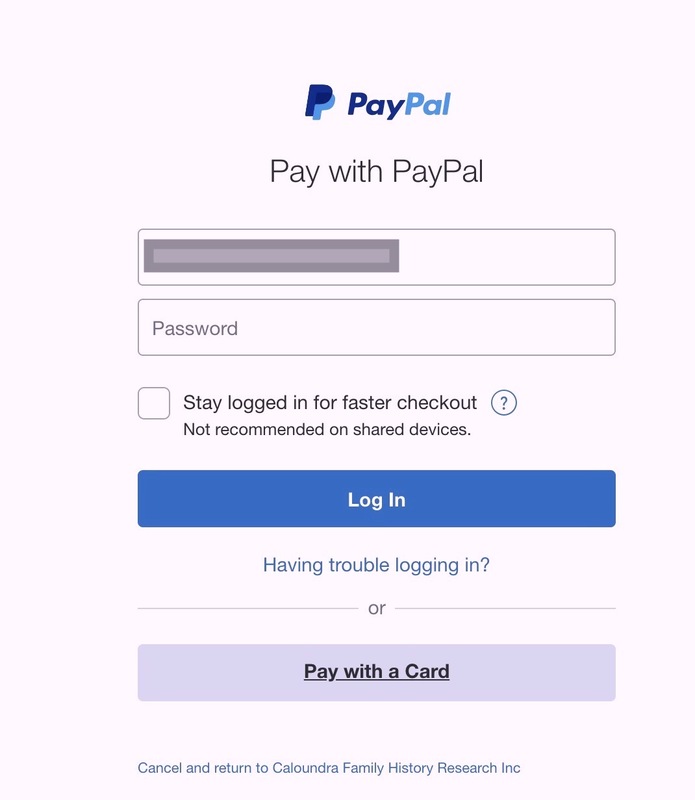 This will take you to the secure PayPal site. You can elect to log into your PayPal account with your email address and password or select “Pay with a Card” if you want to do a one off card payment. See figure 17. You do not need a PayPal account to pay however then you will need to complete more of your details on the forms provided by PayPal. If you have an account select the options you prefer when making your payment. Read carefully and follow the PayPal instructions. If this is your first time using Paypal then do not rush. 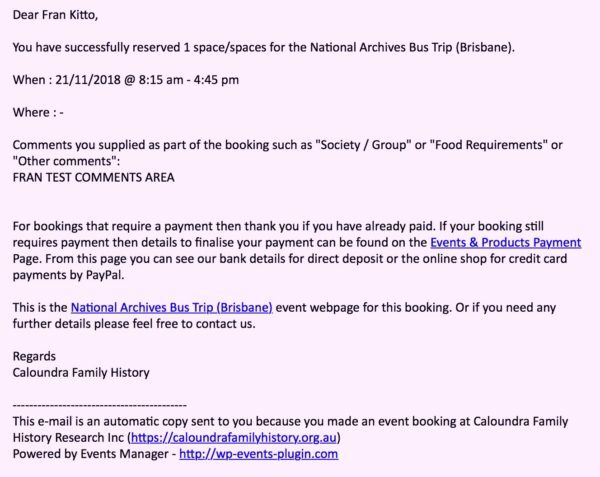 If you change your mind you can cancel out of the PayPal payment before the payment is finalised by using the “Cancel and return to Caloundra Family History Research Inc” link. You will return to the CFH website “Payment Checkout Cancelled” page which provides Direct Deposit details and may show your shopping cart. If showing you can still pay by PayPal if you wish to do so. If the cart has disappeared this might be due to your computer settings or that you actually did finalise the payment. So before reordering and paying again check for an email from PayPal that will confirm if you have paid already. If not then you can reorder at the Events & Products page. Remember PayPal will send you a receipt via email confirming the payment with some details. This transaction will appear on your credit cards statement as PayPal * CFAMILYHIST. When your PayPal payment is successful you return to the thank you page. To SEARCH within a Clipper use the FIND short cut key. This is Control + F for Windows or Command + F on Macs. A new search box may appear somewhere on the page or the application has a permanent search box. Once you locate the search box type in your search word and click the return or enter key. If the document has the word or phrase multiple time then keep clicking the return or enter key to find more. The find option is available in many other software applications such as Word and Excel so it’s handy shortcut that every computer user should know. If you want more help on improving your tech skills come to our special training events or the Tech Help Interest Groups’ next monthly meeting.